Underfloor heating provides a warmth that keeps you comfortable from your toes to the top of your head. The key to keeping your whole body warm is by having warm feet. There is nothing quite like walking around in the middle of winter, barefoot and still being warm. As the heat from the floor rises, it warms the house mildly. This eliminates the need for noisy fans or the smell of open fires or gas heaters. 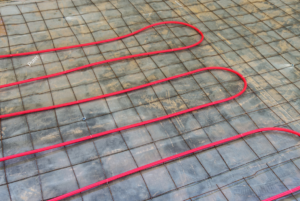 It is best to install underfloor heating while the house is being constructed or when you are already planning on replacing your existing flooring, as it needs to be under the flooring whether it is carpet or tiles. To install underfloor heating into a finished house requires lifting the existing flooring to install the floor heating mats. With a floor like ceramic tiles, this would require the breaking of the old tiles and the additional costs of laying new tiles. That might rule out underfloor heating as a cost-effective alternative for older houses. Do a little homework by calculating the cost of removing the old tiles and laying new ones. It might prove excessive compared to other sources of heat such as a heat pump. The running costs of underfloor heating can also be quite expensive if left to run continuously. For this reason, it is best to be fitted with a timer. You can conserve energy by turning the floor heating off during the day when everyone is out of the house. Set the floor heating to turn in an hour before you wake. Doing so provides a beautiful warm floor when you get out of bed first thing in the morning. Many consumer sites on the internet offer comparisons between the costs of installation and the running costs of the various types of home heating systems. However, many people are happy to pay a little more for the added luxury of the silent warmth of underfloor heating. We’d love to help you warm your toes in the most cost effective manner. Book a showroom consultation today to talk with any of our expert flooring consultants here at Creative Carpet & Flooring. Schedule Now or call us at (888) 910-6585!